Theoretical research on advertising effects at the individual level has focused almost entirely on the effects of advertising exposure on attitudes and the mediators of attitude formation and change. This focus implicitly assumes attitudes are a good predictor of behavior, which they generally are not, and downplays the role of memory, in that, there is generally a considerable amount of time between advertising exposure and purchase decisions in most marketing situations. Recently, a number of researchers have developed conceptual models which provide an explicit link between two separate events -- advertising exposure and purchase behavior -- with memory providing the link between these events. 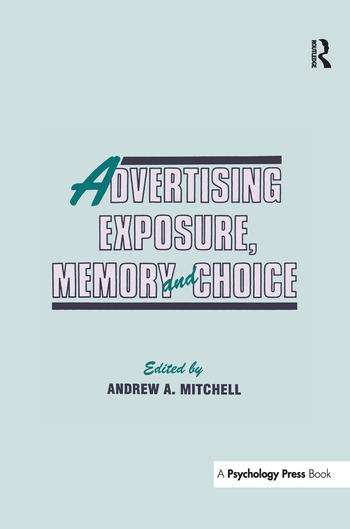 Originally presented at the eighth annual Advertising and Consumer Psychology Conference held in Toronto, some chapters in this volume present recent research on the role of inferences in advertising situations, the effects of exposure to multiple advertisements, message receptivity, drama advertisements and the use of EEG in measuring advertising effectiveness. Contributions focus on research examining the effects of advertising exposure on consumer information processing and decision making. This book will be of interest to consumer psychologists and professionals in advertising and marketing. Contents: Preface. A.A. Mitchell, Introduction. Part I: Advertising Exposure and Choice. K.L. Keller, Memory Retrieval Factors and Advertising Effectiveness. W. Baker, The Relevance Accessibility Model of Advertising Effectiveness. P. Nedungadi, A.A. Mitchell, I.E. Berger, A Framework for Understanding the Effects of Advertising Exposure on Choice. Part II: Psychological Processes in Persuasion. P.M. Herr, R.H. Fazio, The Attitude-to-Behavior Process: Implications for Consumer Behavior. M.P. Zanna, Message Receptivity: A New Look at the Old Problem of Open- vs. Closed-Mindedness. F.R. Kardes, Consumer Inference: Determinants, Consequences, and Implications for Advertising. Part III: Behavioral Models of Advertising Effects. J.A. Edell, Advertising Interactions: A Route to Understanding Brand Equity. A.A. Mitchell, Attitude Toward the Advertisement Effects Over Time and in Attitude Change Situations. A.M. Isen, The Influence of Positive Affect on Cognitive Organization: Some Implications for Consumer Decision Making in Response to Advertising. Part IV: Measuring Advertising Effectiveness. J. Deighton, S.J. Hoch, Teaching Emotion with Drama Advertising. C.E. Gengler, T.J. Reynolds, A Structural Model of Advertising Effects. M.L. Rothschild, Observing Information Processing and Memory Development: The Potential Value of EEG in the Study of Advertising. A.A. Mitchell, Concluding Remarks.